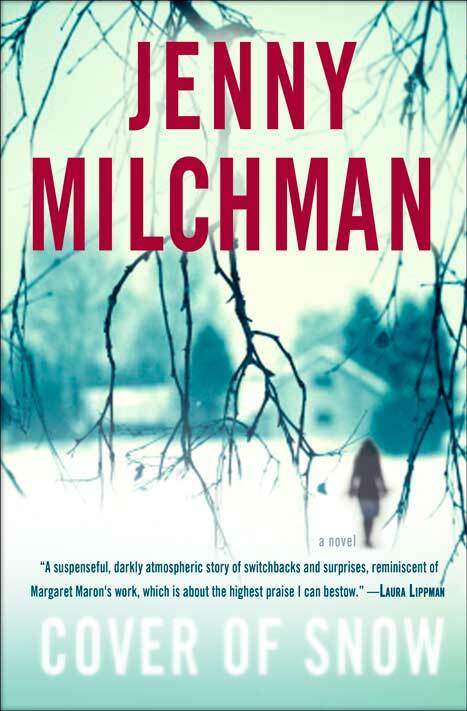 When I heard Jenny Milchman at her book talk at Schuler Books, she nearly put me off reading her first novel, Cover of Snow. She said the story opened with “the worst thing a husband can do to his wife.” My mind immediately jumped to something from either Fargo or The Girl with the Dragon Tattoo. I really didn’t want to go there. Fortunately, neither woodchippers nor torture chambers make an appearance in this suspense novel, just lots and lots of snow, perfect for hiding bodies. The story revolves around Nora Hamilton, a (reasonably) happily married woman who wakes up one morning to find her husband missing. It doesn’t take her long to discover that Brendan has hanged himself in his study. Nora is not only devastated but perplexed: why would Brendan do such a thing when he seemed content and untroubled? As Nora begins to explore that question, she meets resistance from surprising quarters, including her mother-in-law and much of the police force for which Brendan worked. Spending too much time asking why will drive you crazy, the police chief warns her, suggesting she leave their small town in the Adirondacks to visit her family. She’s from down-state, after all. And that only pushes her to ask more questions. She soon learns that her adopted hometown not only has a dark past, but also an even darker present. As Nora begins her journey into the mystery surrounding her husband’s death, she also begins an exploration of her own way of being, one that has kept her emotionally shut off from her husband and family. She seems uniquely uninquisitive about the interior lives of others, making her a good match for a husband with secrets. Now, if she’s going to uncover what happened to Brendan, she must overcome this central failing. Milchman’s skillful depiction of Nora split open by her own grief makes the story not only suspenseful but emotionally compelling. Milchman is a fine writer, with deft prose and a sharp eye for detail. I’d be happy to follow her around any New England town, suspenseful situation or not. In fact, my one quibble with the novel comes from those moments when it too obviously cranks up the suspense. Nora seems to move awfully quickly from devastation to detective-on-the-case, with possible suspects lining up for the reader’s inspection at her husband’s funeral. While most of the novel is told in Nora’s first-person point of view, several chapters in third person show chilling events from a variety of perspectives. James Lee Burke adopted a similar technique at some point in his series of Dave Robicheaux novels. I think there used to be some law of narrative unity against this approach, but if Burke can get away with it, maybe such rules no longer apply. Still, I’d prefer to have the villains looming in the background, making their appearance only when the first-person narrator comes across them. To me, that can be even more suspenseful, and a writer of Milchman’s talent should be able to pull it off. Overall, Cover of Snow is an outstanding debut novel, highly recommended for fans of both suspense and sharp depictions of small-town life. Tangential Postscript: While it’s true this is Milchman’s first published novel, it’s also the eighth one she’s written. She began her first novel thirteen years ago and has had an agent since she began shopping that first novel. She kept coming this close to getting published, but never quite making it. Heads of publishing houses would say they loved one of her novels, but it wasn’t quite right. It shows how broken publishing is that a writer of Jenny Milchman’s caliber couldn’t get published for thirteen years. It’s hard to believe that her fifth, sixth, or seventh novels were that much worse, or unsaleable, than Cover of Snow. Clearly, the publishing industry needed a good kick in the pants. On the other hand, it’s now possible for anyone with some computer skills and an internet connection (or a few hundred bucks lying around) to publish their own work (I hope to be one of them soon). So we’re caught between two poles: a traditional publishing system that can’t connect a good writer like Milchman with readers, and a (largely electronic) self-publishing system that threatens to drown readers and good writers in a sea of dreck writing from all levels of ability. It will be interesting to see how the book world shakes out over the next decade or so. How will discerning readers discover good writers? Will the discerning reader still exist? Will publishing houses still have a role in setting a standard for quality? (And I take with a large clump of sea salt the idea of publishers as gatekeepers — after all, Vintage published Fifty Shades of Bad Jane Austen-ish Dialogue Combined with Cliches from a Dictionary of American Slang and, Oh Yeah, Some Whipping and Handcuffing). Or will it be something like an online book club? Find your favorite writers on Twitter, and read what they read. And if you’re a writer, try to get them to retweet you. Who knows, but it promises to be one thrilling and bumpy ride. Thank you, Larry, for this thought-provoking commentary. On the book and the industry both! You’re welcome. It was a wonderful read! I hope you’re enjoying your book tour.